If they don't cut it out soon, this good news could be habit-forming. 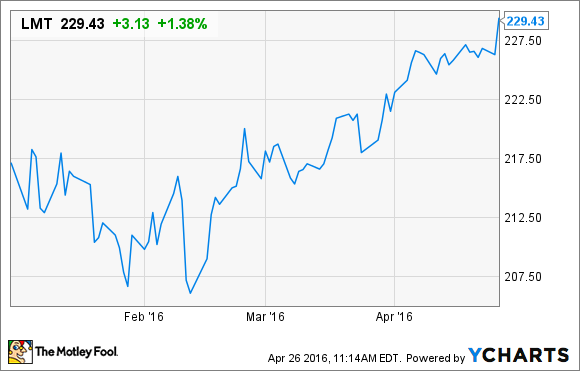 Lockheed Martin stock is having a very good year. LMT data by YCharts. Another earnings season, another earnings "beat" for Lockheed Martin (NYSE:LMT) -- and investors have a lot to be happy about. Across the stock markets, indices are bleeding red this morning. But over at Lockheed Martin, the stock is up more than 2%, and for good reason: Lockheed Martin just topped analyst estimates again. Revenues of $11.7 billion, which was up 16% year over year and easily topped Wall Street expectations for $11.4 billion in sales. 11.1% operating profit margins on those revenues, which declined significantly from the 13.4% margin Lockheed was earning before it burdened itself with Sikorsky's low-margin business. $794 million in net profit (down 10% year over year). And $2.58 per diluted share in profit -- only a penny short of estimates. What does all of this mean to investors in Lockheed Martin stock? Well, the very high-level story is this: Profit margins are down significantly, but this was to be expected. Profit margins are down because when Lockheed Martin bought Sikorsky from United Technologies (NYSE:UTX) for $9 billion last year, it gained a large stream of new revenues that earned very low profit margins. The influx of low-margin revenues diluted Lockheed Martin's own stream of high-margin revenues, lowering the company's overall profitability. This is why Lockheed Martin's profits went down instead of following revenues up. It's also probably why Lockheed Martin is getting more revenues than expected, resulting in profits coming in a bit lighter than expected. One other number we told you to watch in our earnings preview yesterday was the number of F-35 stealth fighter jets Lockheed Martin delivered; gaining scale in F-35 production is so crucial to both sales growth and margin expansion at Lockheed Martin. Here, too, the news was not great: In Q1 2016, Lockheed Martin delivered only six F-35 fighter jets to its customers in the U.S. and abroad. That was 25% fewer planes than in the same period one year ago. (Hint: That's the opposite of ramping sales, guys). But it wasn't all bad news for Lockheed Martin -- far from it. Cash from operations at the company surged 63% in Q1 compared to Q1 2015. Rising capital expenditures hardly put a dent in the flow of new money, and free cash flow for the quarter rose to $1.4 billion. That was a 68% improvement, and it stands in marked contrast to the apparent decline in GAAP "earnings." Thanks to Q1's strong performance, Lockheed Martin has now generated positive free cash flow of $4.7 billion over the past 12 months -- 34% better than the company's "net income" number. Weighed against a market capitalization that now stands at $70.1 billion, Lockheed Martin stock now sells for just 14.9 times free cash flow. Not bad for an expected 10% grower (that just turned in 16% sales growth) paying a 2.9% dividend yield. Not bad at all.